One of my favorite apps on my phone and computer is Dropbox. I just have a free Dropbox Basic account, but it’s been so valuable to me, I just had share why I love it. I have found a number of uses for the app that save me time and simplify my life. If you are already a Dropbox user, you may already know about some of these uses, but others you may have never considered. If there are other ways you like to utilize Dropbox, leave a message in the comments, because I’d love to hear about them! If you’re not familiar with Dropbox, it is a cloud storage service, with mobile and desktop apps. Files saved to your Dropbox folders on your computer or added to Dropbox on your phone will be uploaded to the Dropbox web site and sync’d to your other computers running Dropbox. Using the Dropbox app on your phone, you can access any files stored in your Dropbox cloud account. This is one of the original reasons I started using Dropbox on my cell phone. I was always worried that I’d lose or break my phone and all my recent pictures would be gone. I transferred photos from my phone to my computer periodically, but I hated the idea that I’d lose any new pictures if something happened to my phone. Enter Dropbox. You can enable the Camera Uploads feature in Dropbox, which will automatically upload new cell phone photos to your Dropbox account in the cloud. This is not only a great way to back up your cell phone pictures on the fly, it is also really handy if you want to take a picture on your phone, and then quickly open it on your computer to edit/email/upload it elsewhere. Depending on your data plan, you can configure Dropbox to upload images anytime (using data or WiFi), or limit it to uploading over WiFi only. You can also restrict it to uploading only when you have sufficient battery or when your phone is plugged in and charging. You can move the images from your Dropbox upload folder on your computer to another folder periodically to free up space in your Dropbox folder. Lightroom users: If you import your cell phone pictures into Lightroom, be sure to move the images within LR or import them to LR after moving them out of the Dropbox folder. All of these images in my Instagram feed were posted from Dropbox. This is one of my husband’s favorite use of Dropbox. He created a folder with both our names, and shared it to me. Now either of us can save files to our shared folder for the other one to access. When we do this, it will even pop up a notice on the other person’s computer that a file was added to our shared folder or a file was edited in our shared folder. That way I know to go check what’s there. Some files we keep there all the time for either of us to view and edit. Other files that aren’t needed long-term we remove after a while. He has similar folders for other family and friends that he regularly shares files with. Email is a great way to send messages and simple attachments, but if you need to send a large file or a group of files to someone, email is not a great option. Large attachments can get corrupted, they’re a pain to download on mobile devices, and they take up a lot of space in your mailbox and your recipient’s mailbox. Some people have mailbox size limits, so sending large files can actually cause their mailbox to fill up. It’s much better to upload large files to Dropbox, and then send a link to the file. After saving the file to Dropbox, right-click and select Copy Dropbox link, then just send that link to anyone that you want to have access to the file. For photographers, this is a great way to share RAW files with another photographer. I don’t think it’s a professional way to share a client gallery, but it’s a great way to just transfer a large file to someone else without clogging up their email. This is another one that just simplifies my life and makes things easy for me. Some files are just helpful to have as with you wherever and whenever. By saving them to Dropbox, I can access them from my phone or computer very easily and don’t have to hunt them down again every time I need them. I love to use this for reference files that I need to check periodically. At the beginning of the school year, I save documents from my daughter’s school/teacher about the school holidays, classroom schedule, uniform requirements, etc., and then if anything comes up and I need to check something about school, it doesn’t matter where I am, I can just pull these files up on my phone, my laptop, or my home desktop. Dropbox makes it very easy to work on files when I’m away from home. I have a laptop that I work from occasionally, but it is not my primary computer. If I know I’ll be working on my laptop, I save any files I’ll need to my “Laptop Files” folder in Dropbox for later use. And if I create a file on my laptop, I save it to my “Laptop Files” folder, so that I can access it later from my desktop to continue working on it. I don’t keep any important documents or other files on my laptop that aren’t in the Dropbox folder, because files in that folder are backed up to the cloud and shared with my desktop. I do limited work on my laptop, so my “Laptop Files” folder remains fairly small and only includes files for current projects. This is also really helpful when I want to read ebooks or other PDFs on a phone or tablet. Through Click Photo School, I take photography breakouts and workshops that often include large PDFs and some videos. It’s really helpful to copy the latest files to Dropbox so that I can read them on my phone or tablet when I have some spare time, so I’m free to catch up on the latest material from the comfort of my couch or wherever else I might be. As you can see from this list, I use Dropbox as a holding place for images and other files that I need to move from one location to another or access in another location. I don’t use it as my computer’s backup system, and I don’t recommend others use it for this purpose either. My main reasons for this are that Dropbox is not automated and it’s not complete. A good backup system will backup all of your computer’s files, and it will do it without any intervention or effort on your part. Dropbox is only backing up files that you manually save in the Dropbox folders. Dropbox is also really expensive as a backup solution. I have a free Dropbox Basic account, which is limited to only a few GB, but is plenty for all that I do with it (as long as I move my cell phone uploads off of Dropbox periodically). The cheapest Dropbox paid plan is $99/year, and that is limited to 1TB of space. I pay only $50/year to Backblaze for unlimited backup space, and Backblaze is a real backup solution – it is automated, it’s complete, and it’s designed to be used for system backups. Dropbox is not. 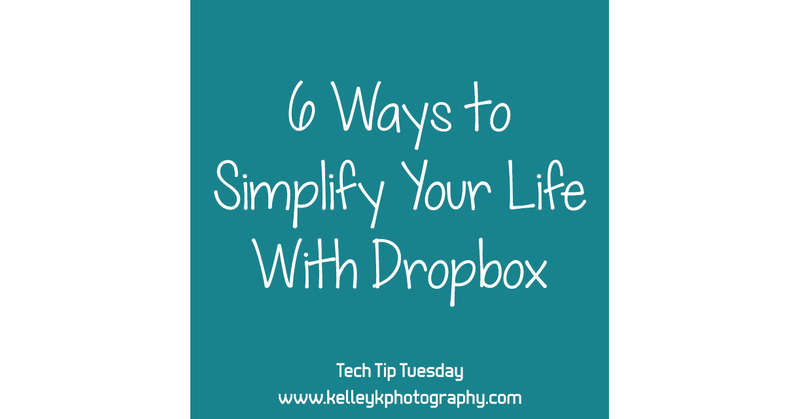 What are some ways you use Dropbox to save time or make your life easier? I hope you enjoyed this Tech Tip Tuesday! Comment below to let me know what you think, or if you have any questions about this or other topics you’d like me to cover in the future. My name is Kelley, and I am the owner of Kelley K Photography, a portrait photography business based in Smyrna, Georgia. I am a member of the Click Pro network of photographers since 2016. In addition to photography, I have 20 years of experience in the IT industry, including consulting, technical writing, web design and hosting, and IT regulatory compliance. I publish weekly Tech Tips on my blog, Instagram, and Facebook, as well as offering mentoring to photographers on technical issues relating to photography, from Lightroom to web hosting. Tech Tip: One Lightroom Catalog or Many? Tech Tip: What Makes a Good Black & White Image?